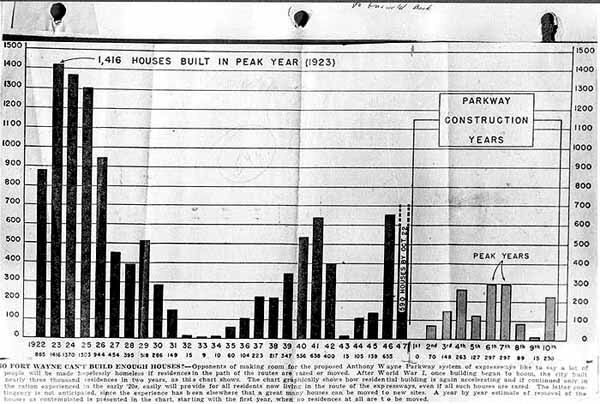 The graph below, housed in the Allen County Public Library Digital Image Collection., expresses Fort Wayne's need for an expressway system by 1947 when a building boom similar to the boom of 1923 was anticipated. It plots number of houses built versus year in time. The same graph turned on its side as a Kryder Asset Timeline, has caused the Personal Representative to say, "show me the money." Formation in Time of Legal Entities of Clarence, Minnie, and Frank Kryder are shown in red quotation. In blue text are indicated the relative areas of heavy real estate development and dates in time of larger Trust Deeds. Essentially, adding up the Plats and Deeds indicates the Kryders were often building when no-one else was. This is the Fort Wayne residence of Clarence Frank and Minnie V. Kryder on St.Joe Boulevard, as it appeared when they lived there 1920-1960. The house was built in R.L.Romy's Subdivision of Hanna's Park Outlots. When Minnie's estate was appraised in 1963, her only property was two Kryder Company,Inc. stock certificates to which the house was titled. When the house was sold to close the estate, the mortgage given to Thornbury was owed to Colonial Mortgage. That mortgage was later assigned to Rockford National Bank which became inactive in 1972. Paul E. Shaffer, who became CEO of Fort Wayne National Corporation in 1970 worked in Rockford National Bank and as a Bank Examiner before beginning his career at Fort Wayne National Bank in 1952.